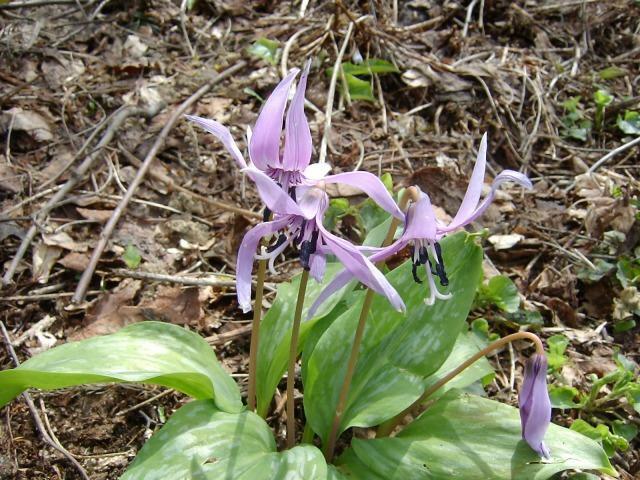 Erythronium is a genus of about 20 species in the Liliaceae family. 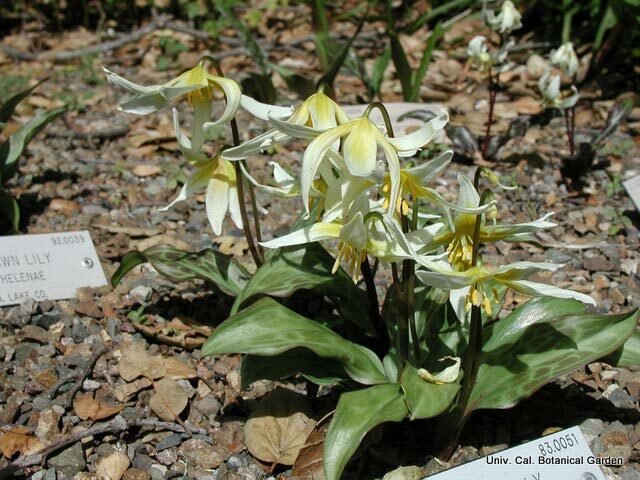 Most of the species are from Western North America but there are also a few in eastern North America and Eurasia. 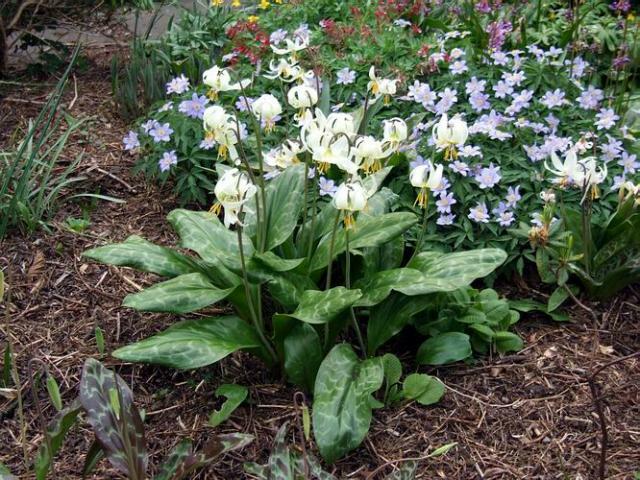 They are woodland or mountain meadow plants enjoying humus rich but well drained soil. 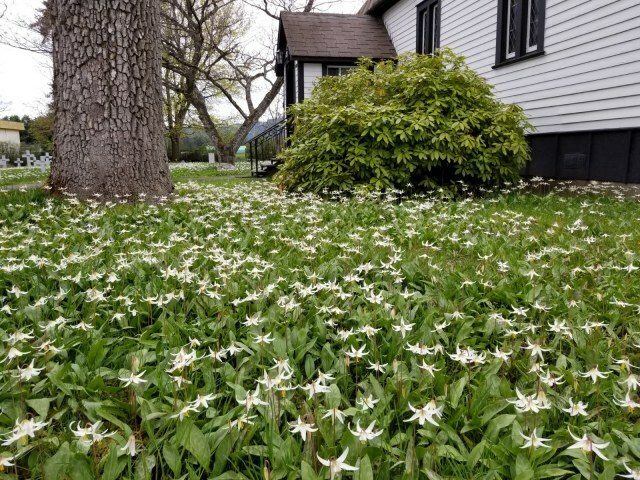 They bloom in the spring. 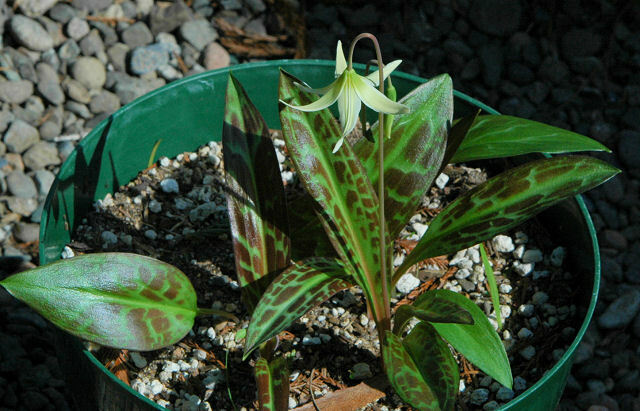 Erythronium species and cultivars H-O are found on this page. 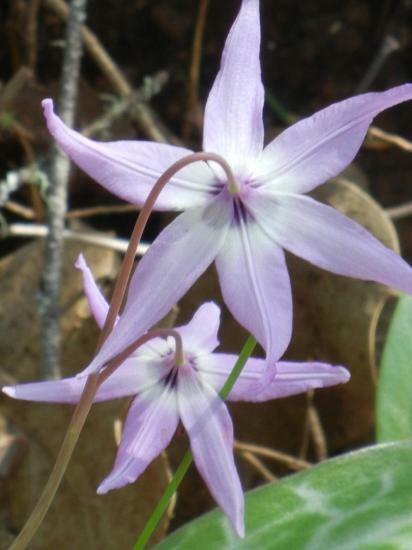 Erythronium helenae Applegate is a rare species found in dry serpentine soils in oak and pine woodland and chaparral in Napa and Sonoma Counties, California. 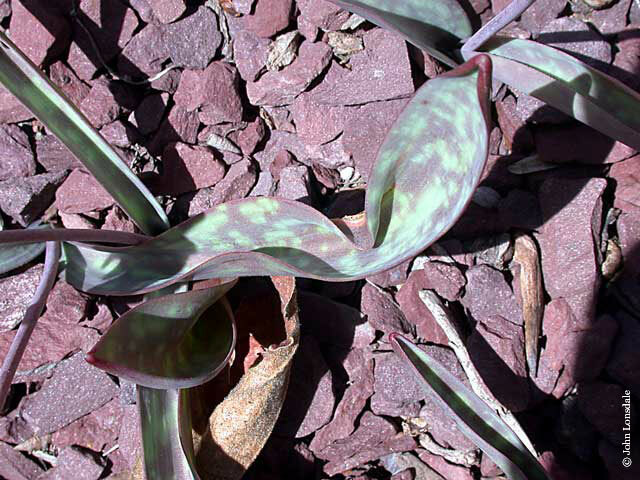 It appreciates warmth during its summer dormancy. 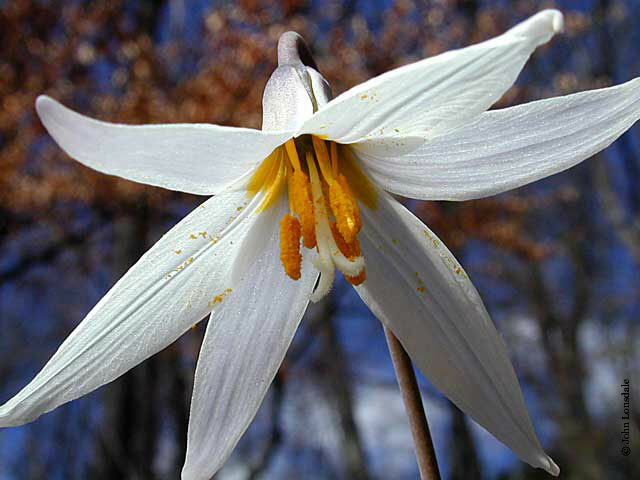 Leaves are mottled and it has large white widely opened flowers with a yellow base, yellow anthers and auricles at the petal base. On warm days it smells of orange blossoms. First photo by Ian Young. Photos 2-5 were taken by Mary Sue Ittner. Photos 2-3 show plants in cultivation grown from seed and 4-5 are of plants seen growing on a gravelly bank in Lake County very close to Sonoma County. 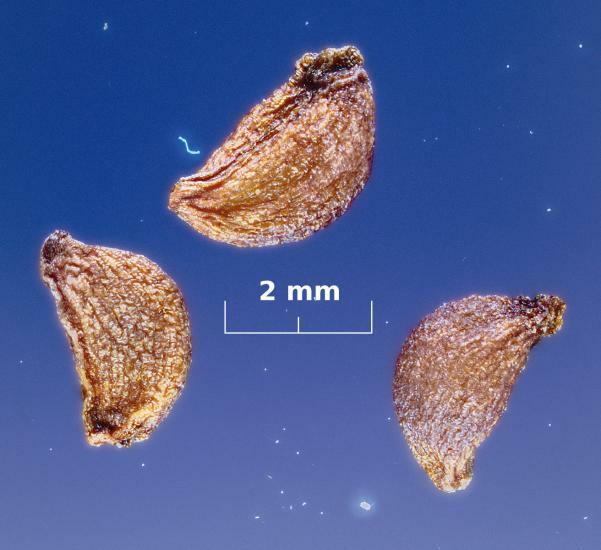 This photo by Mary Sue Ittner shows bulbs on a 1 cm grid. 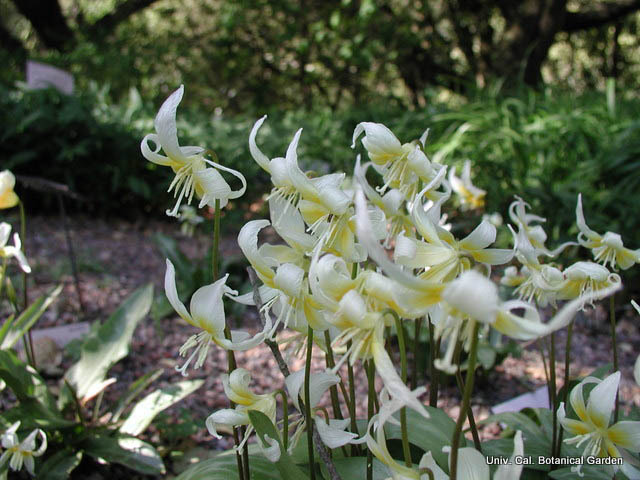 The first two photos below were contributed by the UC Botanical Garden showing the habit of the plants in flower. The last was taken by John Lonsdale. 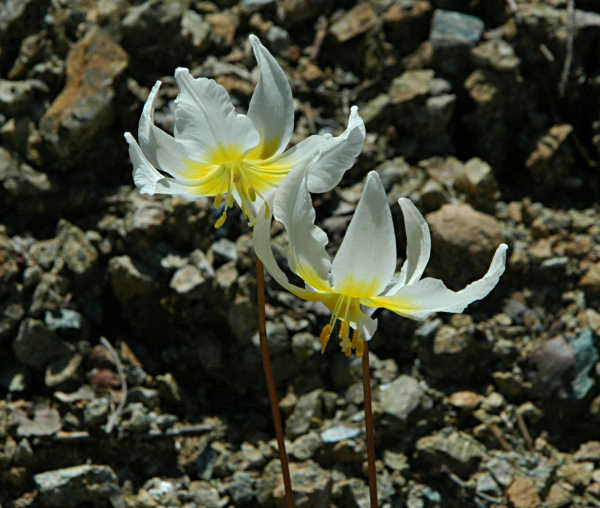 Erythronium howellii S.Watson is native to the Siskiyou Mountains of southern Oregon and northern California. 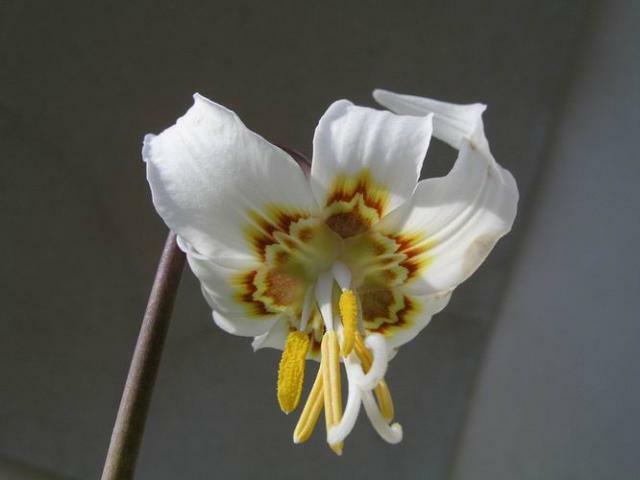 It has mottled leaves and white flowers with yellow or orange inner markings. First photo by Ian Young. 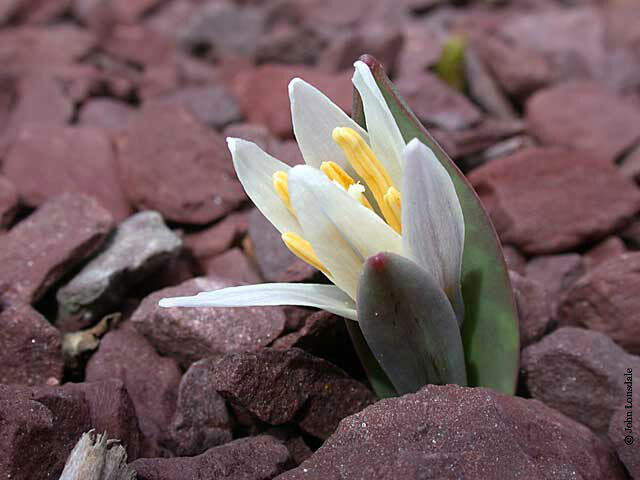 Remaining photos from Mary Sue Ittner including one of a newly sprouted leaf. 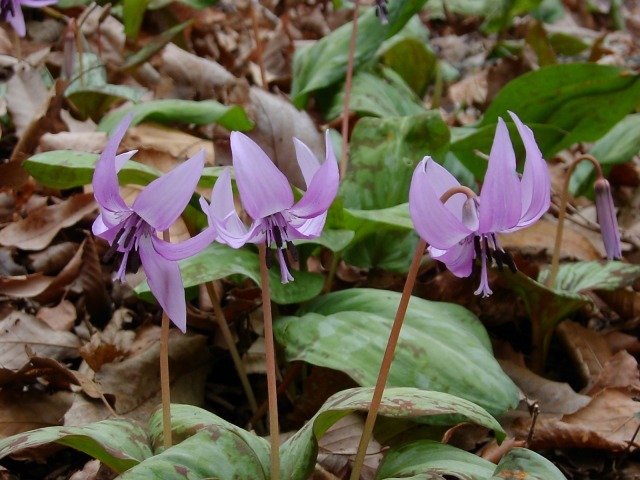 Erythronium idahoense H.St.John & G.N.Jones is from Eastern Washington east into Idaho in pine woods. 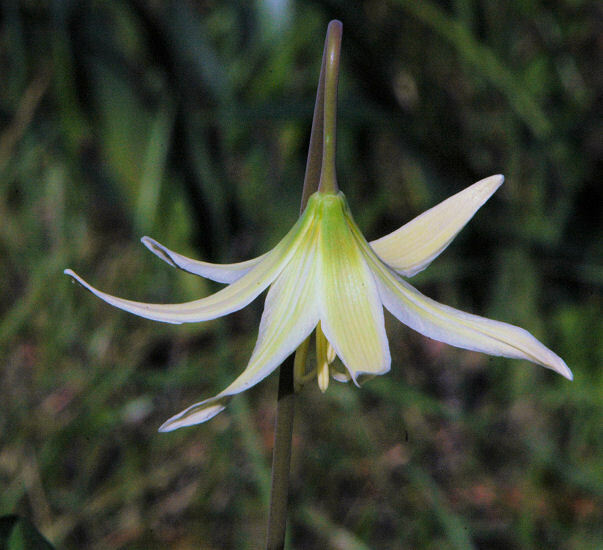 It has plain green leaves. Photo by Ian Young. 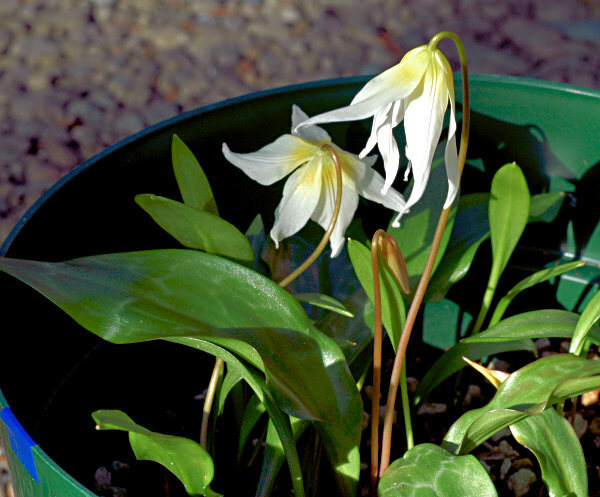 Erythronium japonicum Decne. is a member of the dens-canis group and is often described as E. dens-canis ssp. japonicum. 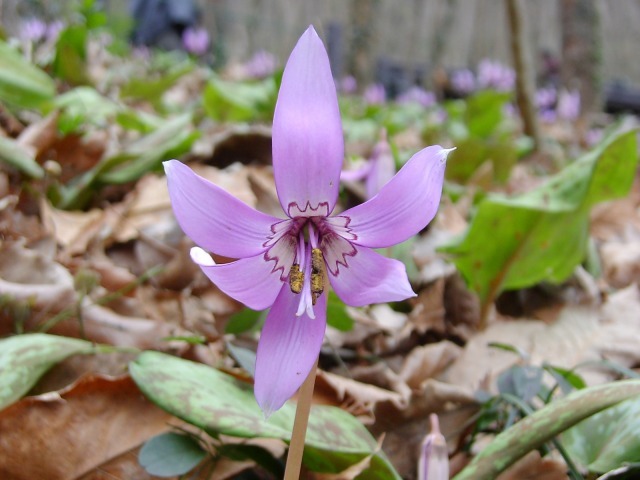 It is renowned for the deep violet color of its flowers. 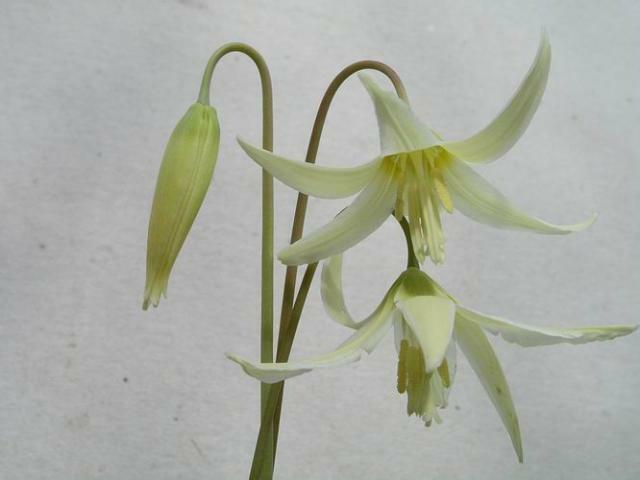 Would-be purchasers are warned, however, that there are strains grown for food purposes in Japan that have mediocre flowers and these are often what is sold as E. japonicum. 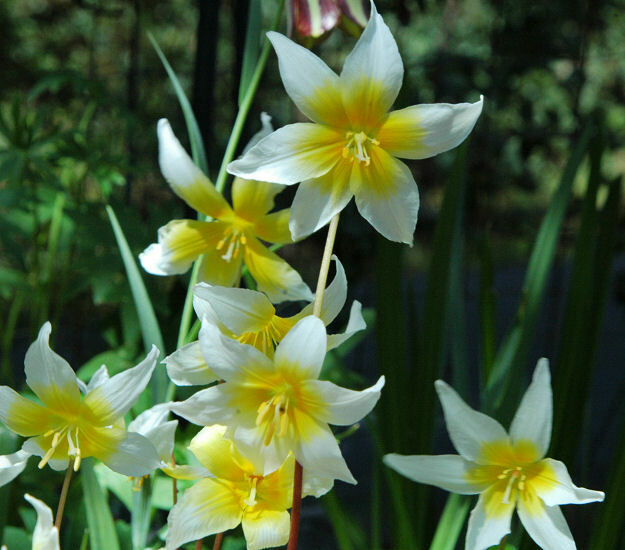 This is definitely a bulb to be purchased either in flower or from a source known to be extremely reliable. 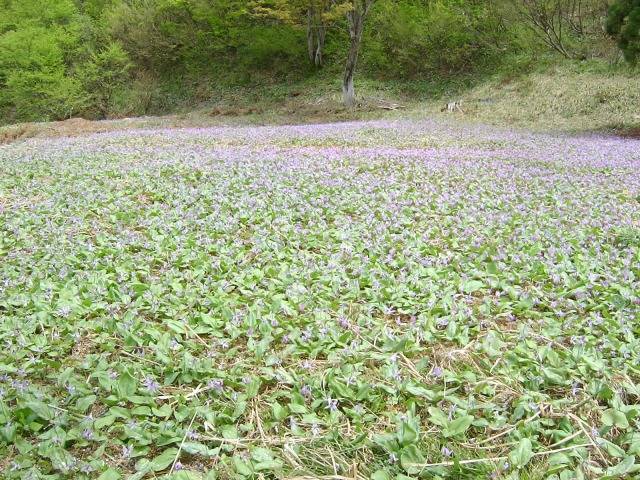 Photos by Mari Kitama taken in May 2010 at the Sakato mountain (600 m) in Japan. 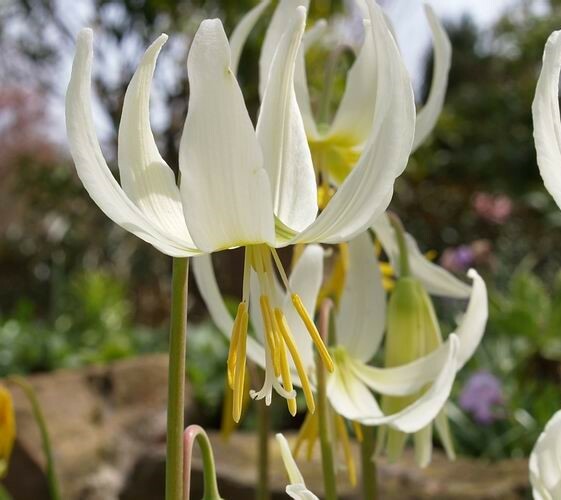 The last one shows a white form which is very rare. 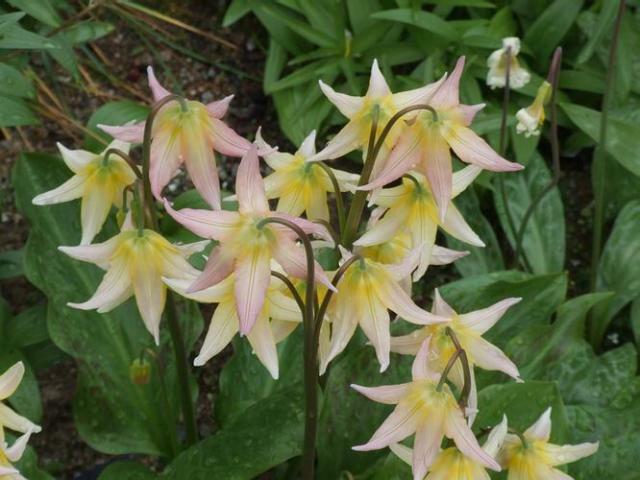 Erythronium 'Joanna' is a hybrid between Erythronium tuolumnense and revolutum. 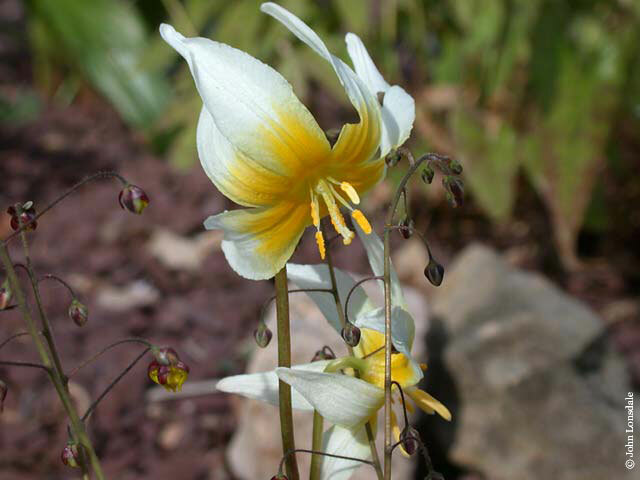 The flowers open as a pale yellow, then fade to pink, which becomes a bicoloured mix of yellow and apricot. Photos by Ian Young. 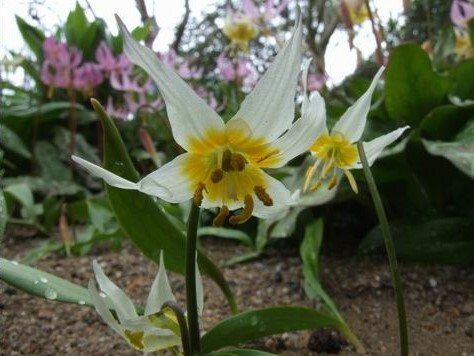 Erythronium klamathense Applegate is a rare species native to Northern California and Southern Oregon in the Klamath ranges and the southernmost Cascades. 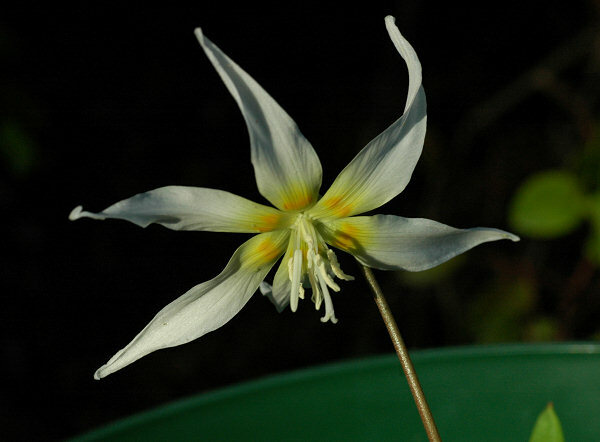 It has appendages at the base of the petals and plain green leaves. Photo by Ian Young. 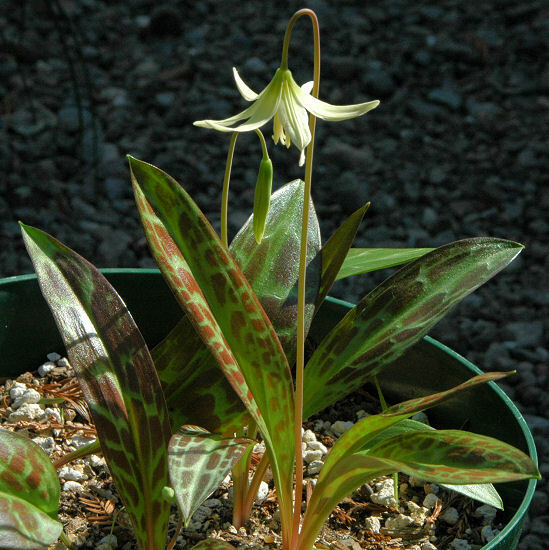 Erythronium krylovii Stepanov (syn. 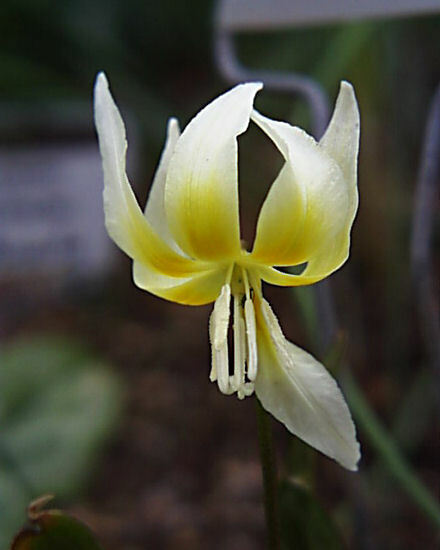 Erythronium sibiricum ssp. 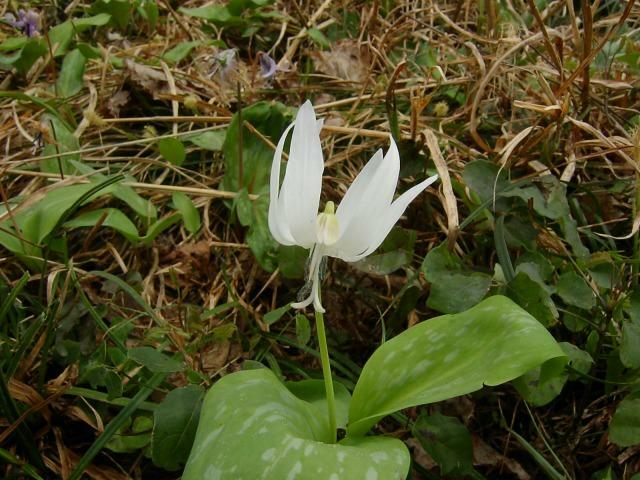 altaicum Rukšāns) is known only from the Tuva and Krasnoyarsk regions in Siberia. 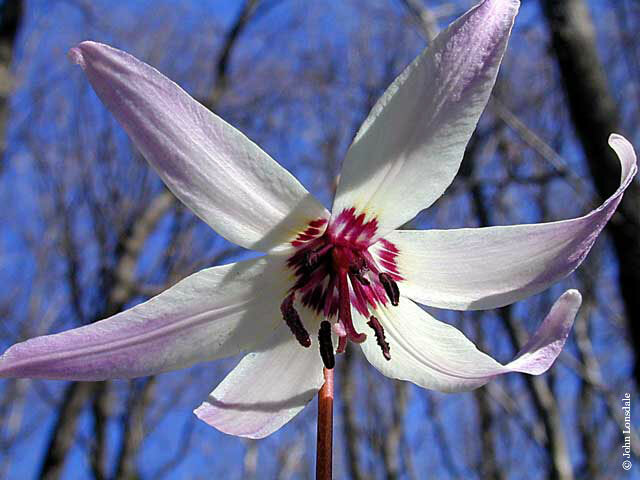 It has wide white petals with a yellow base, aging to mauve. Plain green leaves. 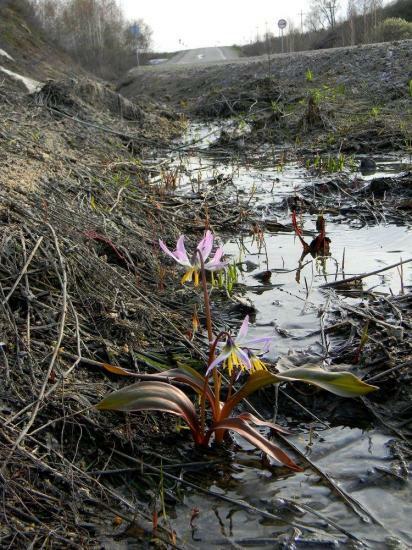 Photo by Andrey Dedov of a plant growing in a roadside ditch. 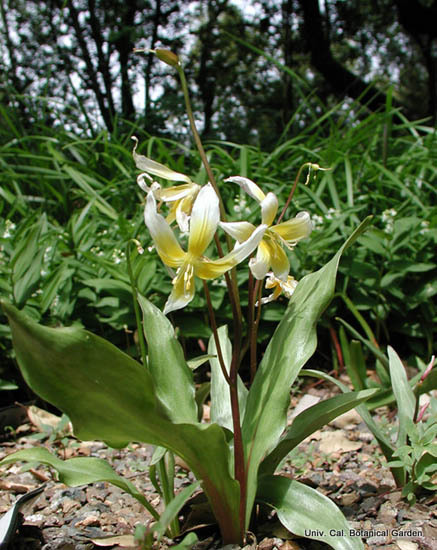 Erythronium mesochoreum Knerr is found in Iowa and Nebraska south to Oklahoma. 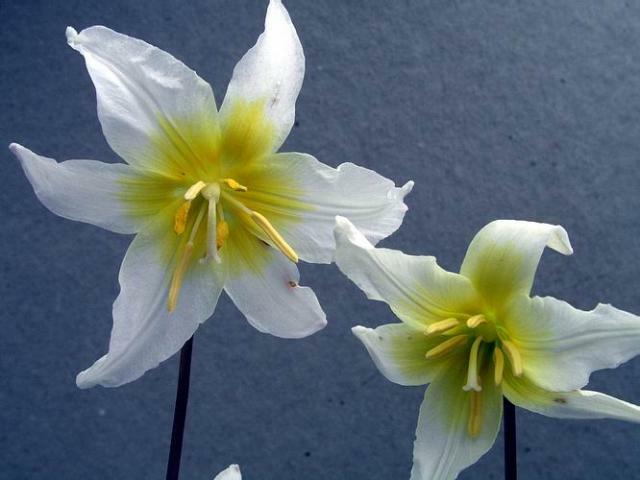 It has small white to pale lavender flowers with a yellow center. Photos by John Lonsdale. 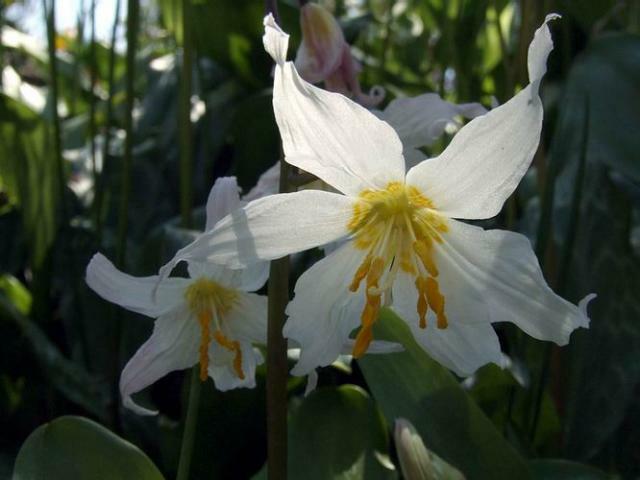 Erythronium 'Erythronium 'Minnehaha' is a cross using E. oregonum as the pollen parent and E. 'White Beauty' as the seed parent. 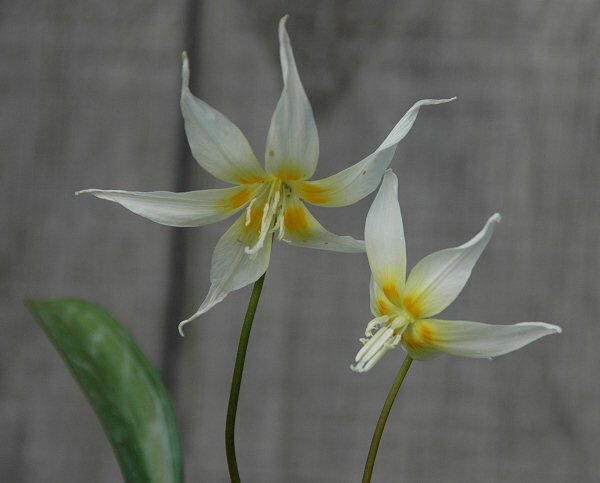 Bred by the late John Walker from Sevenoaks in Kent. Sometimes its name is erroneously written as 'Mini Ha Ha'. Photos by Ian Young. 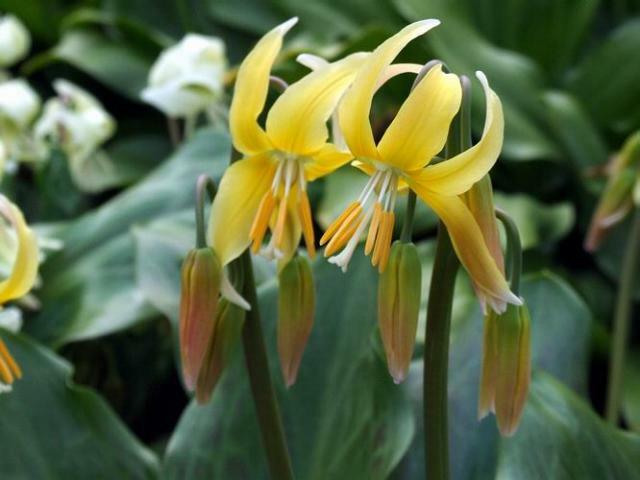 Erythronium montanum S Watson is native to alpine and sub-alpine meadows in mountains from British Columbia to Southern Oregon. 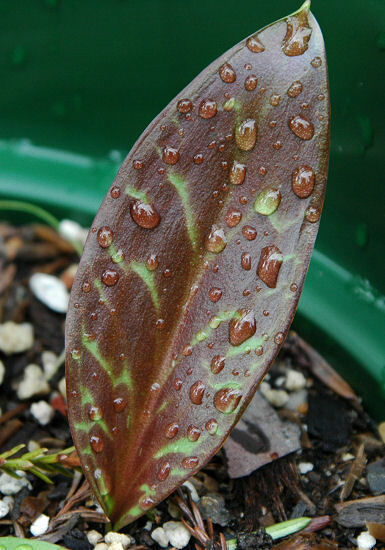 Its leaves are plain green and shiny. 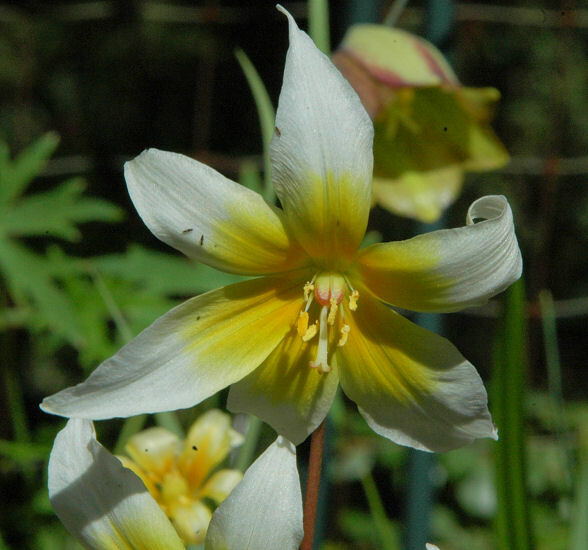 The white flowers have bright yellow centres and a distinctive three-part stigma. 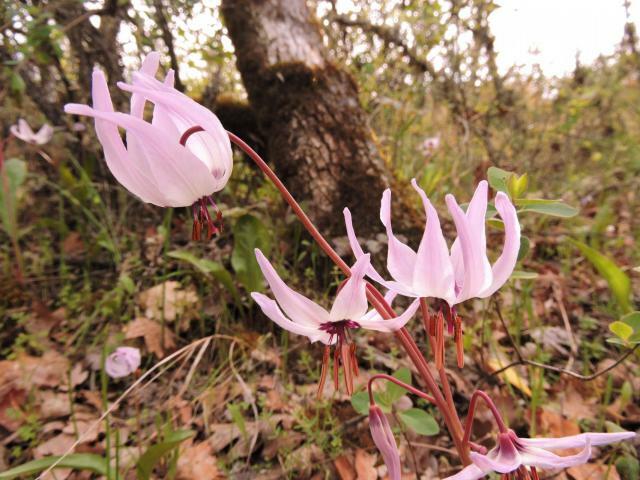 Buds ranged from white to dark pink, but the flowers were all white. 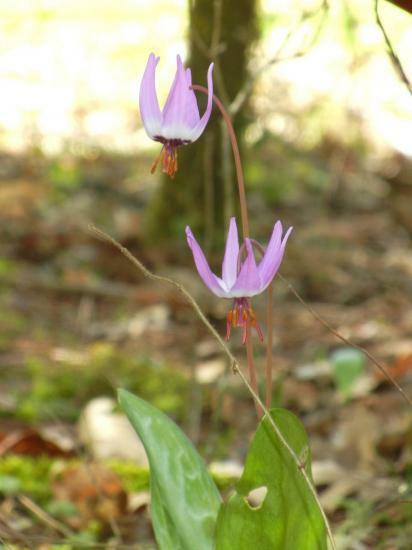 Though erythroniums from high altitudes are often difficult to grow at sea-level, some of the medium altitude plants rescued from this logging site are growing well in wooded gardens at a lower elevation.First photo by Ian Young. 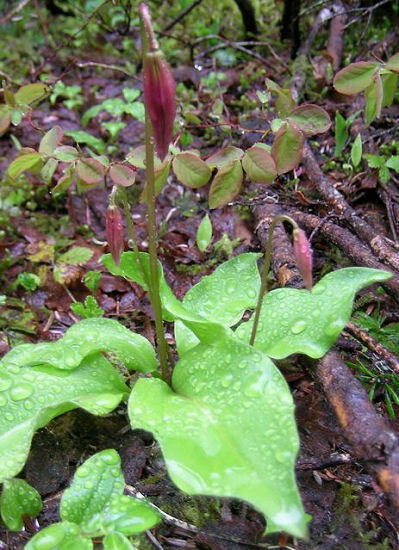 Remaining photos are of plants flowering the end of May along the San Juan Ridge on southern Vancouver Island taken by Diane Whitehead. 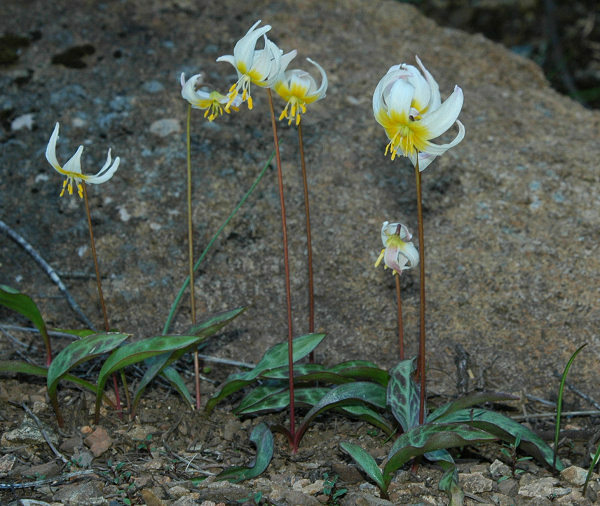 Erythronium multiscapideum (Kellogg) A.Nelson & P.B.Kennedy (note: spelling of species name corrected from earlier common, but incorrect spelling, Erythronium multiscapoideum, used in many reference books) is native to the wooded slopes in the foothills of the Sierra Nevada of California. 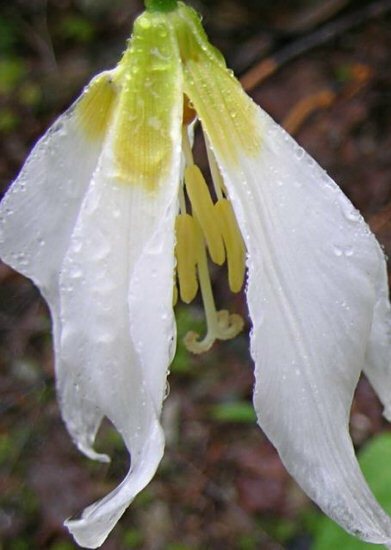 It has become a good garden plant and one of the first western species to bloom with white flowers with a yellow center. 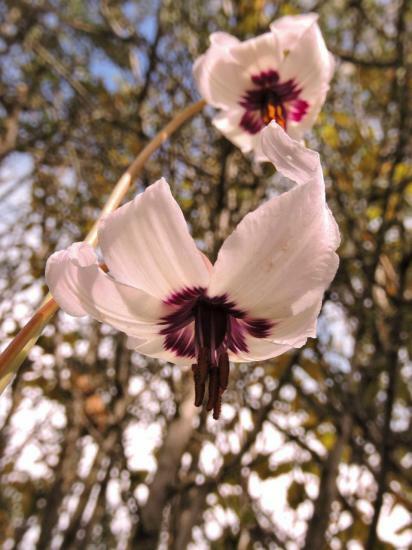 Photos #1-3 by Mary Sue Ittner below show a back view with multiple stems which is one of the distinguishing characteristics and the leaves and more flower pictures. Photo #4 was taken by Arnold Trachtenberg. 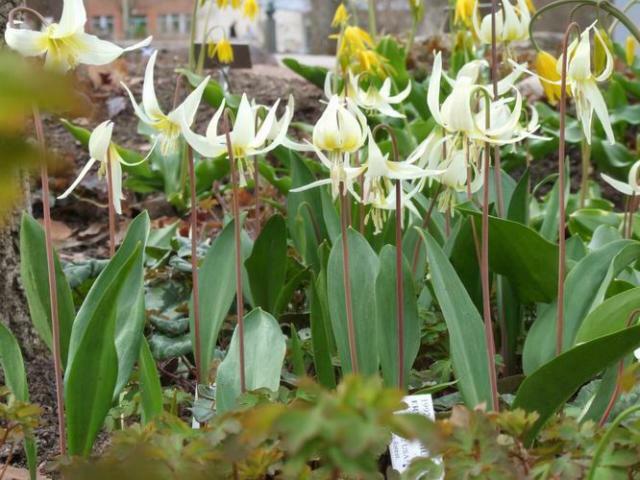 Photo #5 was contributed by the UC Botanical Garden showing a nice clump in bloom. 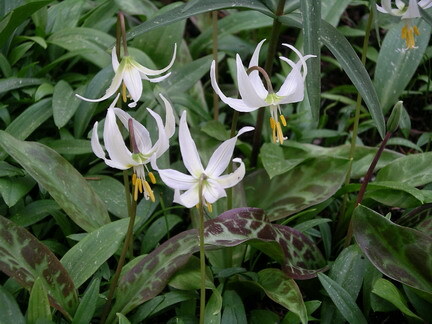 Erythronium oregonum Applegate is native from southwest British Columbia to Oregon and is known as the white fawn lily. 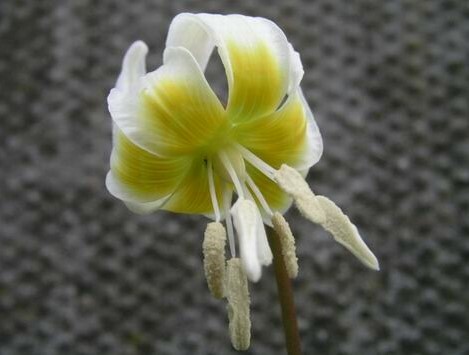 It has slightly recurved white flowers with golden central markings and anthers nod above mottled green strap leaves. 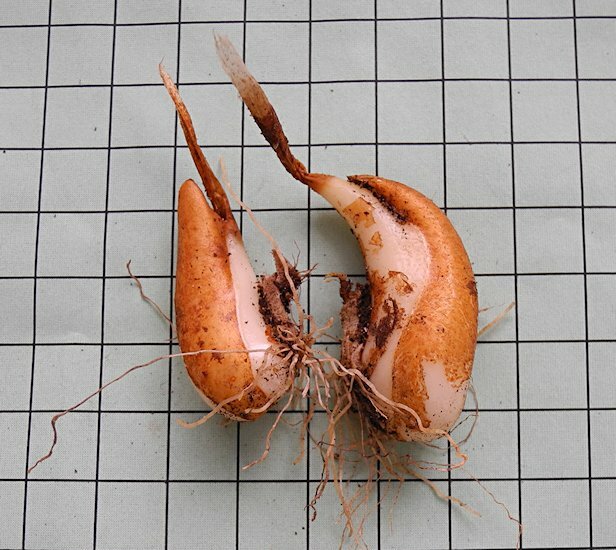 It grows to 20 cm (8") and is hardy to Zone 6. Photos 1 and 2 from Paige Woodward. 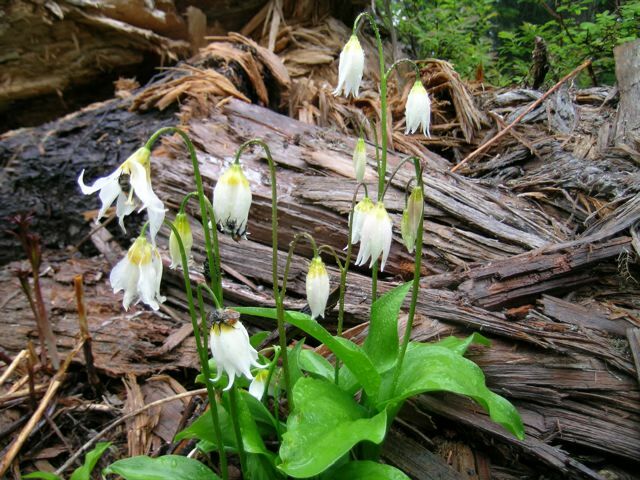 Photo 3 taken by Jill Peterson where it was flowering in mass in April near old St. Mary's church in Metchosin, Canada. Photo 4 of seed by David Pilling. Photos by Ian Young. 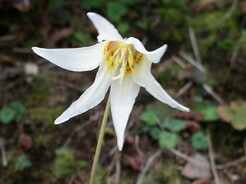 Second photo of Erythronium oregonum subsp. leucandrum.